In our series of letters from African journalists, Joseph Warungu reflects on how the Bible has taken centre stage in the battle for the Kenyan presidency. If opposition leader Raila Odinga contests and wins the presidential election re-run on 26 October, a large chunk of the Kenyan population will be about to enter the biblical land of Canaan. 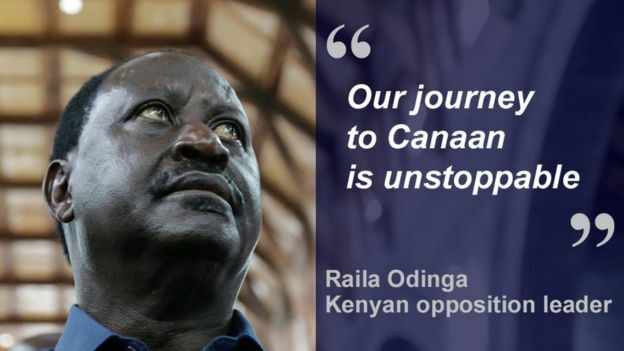 This is because Mr Odinga has succeeded in boiling down the entire manifesto of his umbrella group of opposition parties into a single memorable phrase – “tunaenda Kanani” – Swahili for “we’re going to Canaan”, the land that flows with milk and honey. Presidential elections in Kenya have become a complex affair. In the past it was enough to shout yourself hoarse on campaign platforms, lock up or silence your critics, change the constitution at will, distribute a few goodies to supporters and you would wake up at State House. Now you need a multi-million dollar budget to hire helicopters, control the media, buy out political parties, patrol the digital space viciously and consult the best traditional herbalists. In addition, you have to know your Bible well in the search for special anointing. And so Mr Odinga – the presidential candidate of the National Super Alliance (Nasa) – has carefully studied the Book of Joshua and cast himself in the role of the famous hero who succeeded Moses, and led the fight to liberate enemy territory and settle the Israelites in the new land. 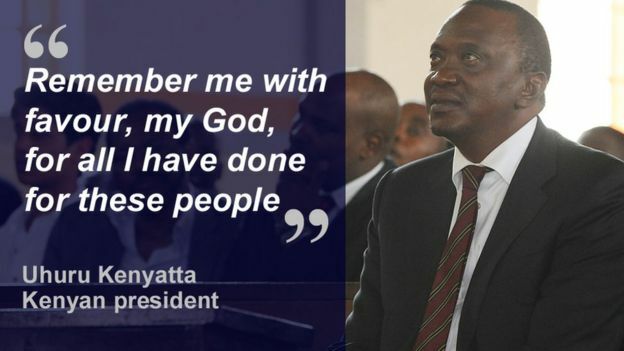 Meanwhile, President Uhuru Kenyatta and his deputy William Ruto, who are seeking re-election, must be suffering from sore knees, as they have moved from church to church kneeling before men of God, who lay hands on them and give them the anointing. Mr Ruto has been at the centre of a spiritual storm as leaders of the Pentecostal Assemblies of God try to interpret what his recent donation to them of 10m Kenyan shillings ($68,00, £51,000) could mean. Some say it was gift for the development of the church, while others argue it was a political tithe to sway them to vote for his Jubilee Party. 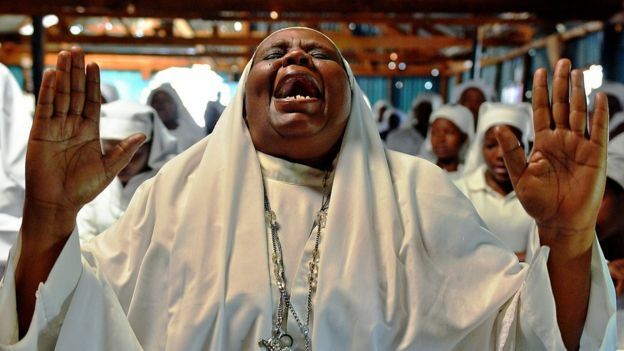 In a country where people’s hopes for a better future have often been crushed by bad politics, endemic corruption and deep-seated tribalism, many Kenyans have always put their faith in God. He is the only constant and unchanging force for good. When faced with any calamity, Kenyans have been known to go on their knees to seek God’s intervention in mammoth prayer meetings that are broadcast live on the media. The politicians have woken up to the fact that they live in a nation of believers and to reach them you need to be seen to be God-fearing. In May, newspapers published a photo of Mr Odinga praying at the historic Western Wall in Jerusalem, during a visit to Israel. Mr Odinga explained that the Wailing Wall was more than 5,000 years old and was sacred to all three Abrahamic religions – Islam, Judaism and Christianity – and that to him it was a very strong symbol of strength and unity. With the rival presidential candidates keeping their Bibles close to their chest, Kenyans have been on the look out for any divine sign that could help them decide which of the two is the anointed one. Earlier this year, President Kenyatta caused an online tremor when he became a “rainmaker”. 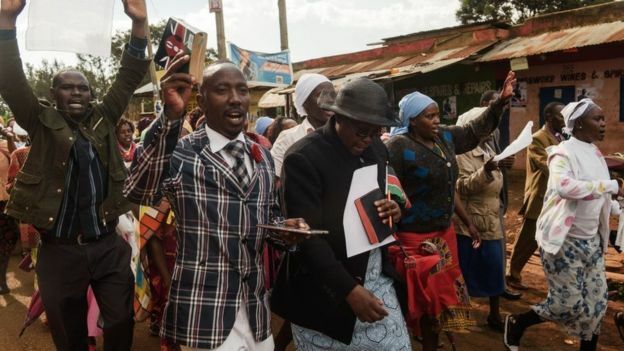 On a voter registration drive in Nyeri in central Kenya, the crowd urged the president to pray for rain in the area, which had experienced a drought. To counter Mr Odinga’s metaphorical journey to Canaan, supporters of President Kenyatta, who is left-handed, have also delved into the Bible for inspiration and likened their candidate to King David. The Jubilee Party faithful have gone to the Book of Judges, which refers to 700 left-handed soldiers from the tribe of Benjamin being excellent in the use of the sling as a tool of war. David too was an expert with the catapult and some therefore argue he must have been left-handed. And so images of President Kenyatta writing with his left hand have done the rounds on WhatsApp to confirm his leadership credentials. The Bible was at the centre of a political storm again when angry bees attacked police and protesters outside the Supreme Court on 20 September, as judges gave their full ruling for annulling the August election, saying that it was marred by irregularities. With the electoral commission announcing a new date for the presidential poll, social media platforms, especially WhatsApp, are again awash with biblical messages and prayers for the two main candidates. But now it is no longer a laughing matter. I have seen a number of prayers shared on WhatsApp from both sides of the political divide that are Bible-based but with violent overtones. The intention is to stir up ethnic hatred and use the Bible as a legitimate weapon of war. Mr Odinga ended his Supreme Court battle with the Book of Joshua: “Our journey to Canaan is unstoppable,” he said. I am not quite sure what Israeli Prime Minister Benjamin Netanyahu will make of the Kenyan invasion, but presumably Israel’s intelligence agency, Mossad, has armed him with the appropriate Bible verses. Next articleHas Mumbai become India’s most unliveable city?